Make your own healthy, fermented pickled vegetables with a few minutes preparation and 5 days time using these steps and one easy tool. I don’t know about you, but for years I always thought ‘fermented’ meant bubbly, strong flavored, and possibly slimy. That’s just what the word conjured up in my mind for some reason. Now that I think about it, it probably came from those big barrels of gigantic pickles you could buy one at a time (does anyplace do this anymore?). I hated those things and really did think they were slimy. 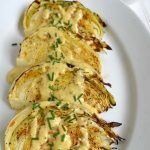 I did realize of course that some things like wine and vinegar resulted from some sort of fermentation and I happily used them (when someone else made them), but the general unease regarding fermented foods still held out. 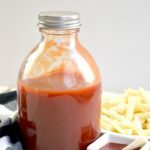 Because of this, I’ve never really wanted to even explore fermented foods – not even as we ate more whole, real, foods or as I realized how many things I used to buy that could be easily made healthily and cheaply at home (like salad dressings, mayonnaise, and ketchup). But as I started to become more aware of the importance of gut health and that fermented foods are one of the things mentioned over and over that feed good bacteria in our intestines, I got curious. How hard were they to make? What did they taste like? I bought some refrigerated sauerkraut and kimchi to taste and see how I could use it in our daily diet. I loved the kimchi (I like things spicy), but found the sauerkraut bland. Which of course made me think I could make it with more spices! And so I started down the path of fermenting. And guess what I discovered? It’s just natural pickling! Don’t laugh – I really didn’t get it before actually doing it and tasting the result. I didn’t realize that if you let vegetables sit for awhile in salt water that they will pickle, just like in vinegar. I love pickles! Green beans, cucumbers (though just the small ones – those giant ones from my youth still haunt me), asparagus – they are all on my ‘must make’ list every season. 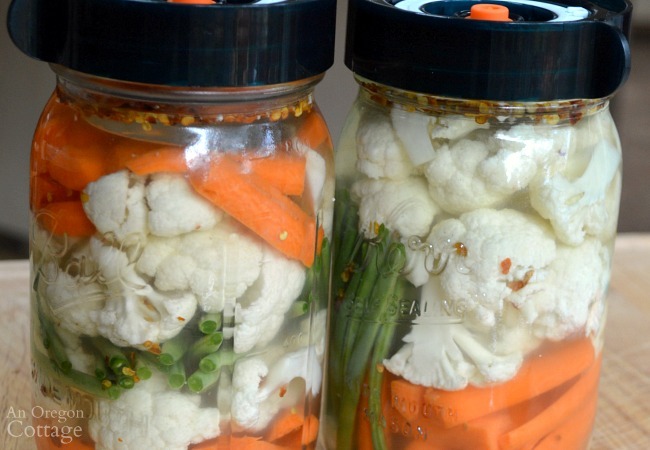 Here’s the thing, though – canned vegetables pickled with vinegar, while not bad for you, are not good for your gut like fermented vegetables are. They are not the same thing (again, something I didn’t know). You want the good bacteria that can only come from fermenting. 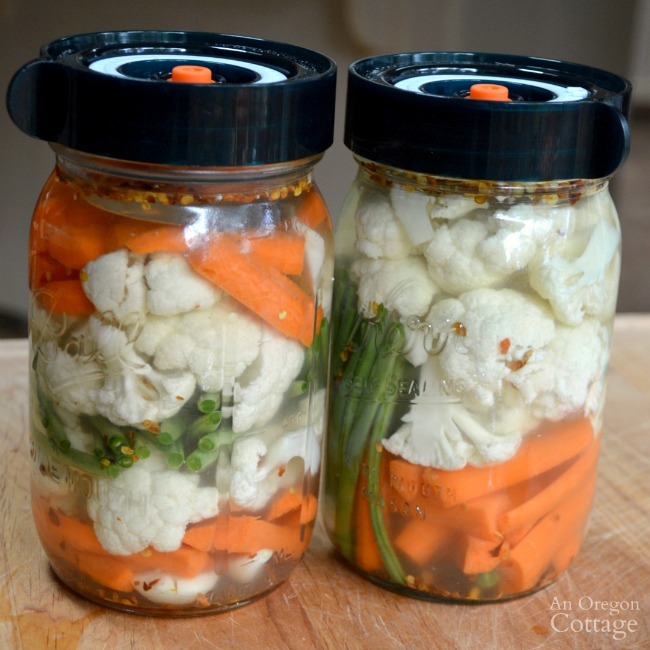 I also discovered that fermenting, an age-old method of preservation, is easy and can be used right along with canning to keep garden harvests through the winter, though stored in a refrigerator. Since I like things crisp, I have already been using the fridge storing method for garlic dill pickles and pickled jalapeños, so it will be easy to adapt these to fermented if I want. I’m going to be sharing more fermented vegetable recipes with you in the future, but I wanted to start with the easiest and fastest so you can taste for yourself how wonderful fresh, fermented pickled vegetables are – and the tool that can make all your fermenting practically effortless. 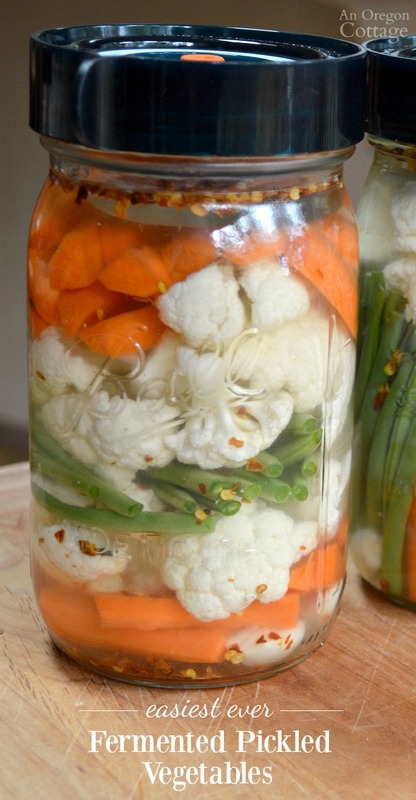 To make fermented pickled vegetables you need only some vegetables and salt at the basic level. But what fun would that be? Let’s add garlic and red pepper flakes for spiciness. I’ve also tried crushed black peppercorns in some jars which is good, too, if you’re not sure you want the full-on red pepper spice (I have found, though, that the fermenting diminishes the spice of red pepper and I’ve needed to add a lot more than in my vinegar pickling recipes). As far as the types of vegetables, stick with anything you know will stand up to pickling. 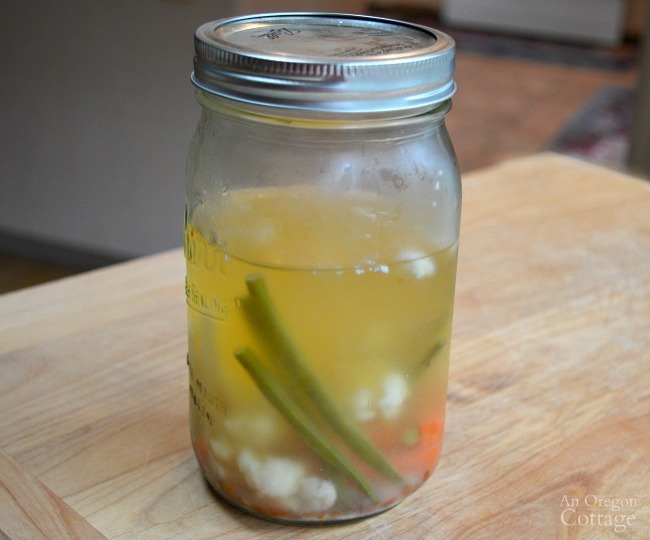 So far I’ve fermented cauliflower, carrots, and green beans. I plan on using asparagus and cucumbers as the season progresses. You can use all of one kind or a combo like I show above – like all things you make yourself, customize to your heart’s content. 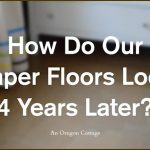 The part of fermenting that intimidated me (after getting over my initial misconceptions), was the whole burp-the-jar-daily thing and the potential for mold I kept reading about. If you don’t constantly monitor the jars, you could find your counters covered in brine that’s oozed from under the jar lids. And there’s big debate on weather you should scrap off any mold or dump the whole jar. Yikes. Enter the Easy Fermenter Lids. I’ve mentioned these earlier because I was so excited to share this discovery with you. The comments on Amazon convinced me to try these over other so-called easy lids and I’m glad I did. They have been truly as set-it-and-forget-it as you can be with fermenting. I’ve made half-gallon jars of sauerkraut and kimchi, quart jars of corn relish and these pickled veggies without any mold and only one instance of overflow because I filled the jar too full. I LOVE these jar lids. They took all the trepidation out of fermenting for me. 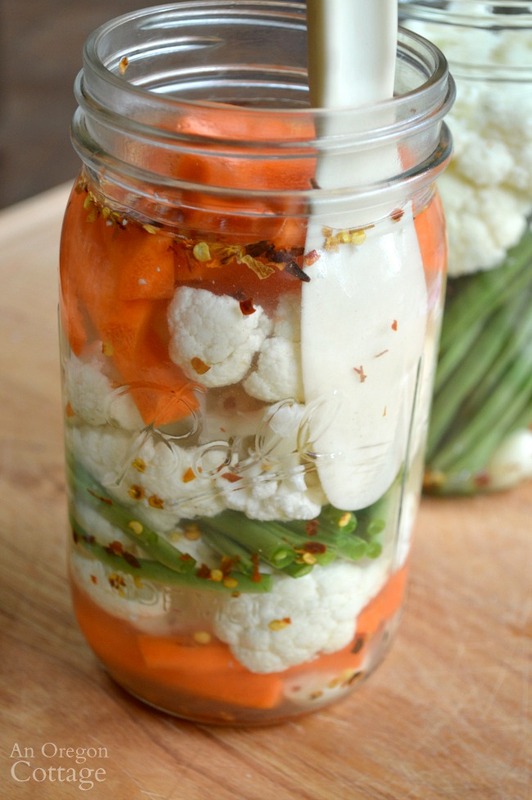 Let’s make some fermented pickled vegetables! 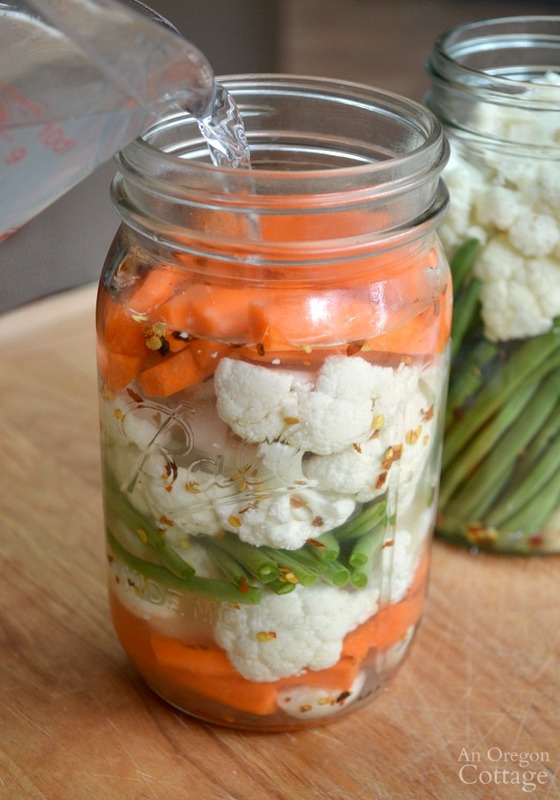 Grab a quart mason jar and start layering your prepared vegetables (you can cut them any size you want). Press down as much as possible to fit as many as you can into the jar to just under the shoulders which should be 1 to 1-1/2 inches of headspace. Finish with a sprinkling of red pepper flakes or other spices you’d like. Since these pickles don’t need to ferment as long as things like sauerkraut (which takes weeks), you can leave less space, but it’s good to err on the side of more space I think. Use a thin, plastic spatula (still one of my favorite kitchen tools!) to release air bubbles by pushing down the sides all around the jar. While not a crucial when using the Easy Fermenter Lids and short fermented recipes like this one, I still like to use a weight to make sure the top vegetables stay under the brine. I bought a set of three of these glass weights which work great, even though I thought they were too small when I first saw them. Turns out it is enough to keep everything under the liquid. 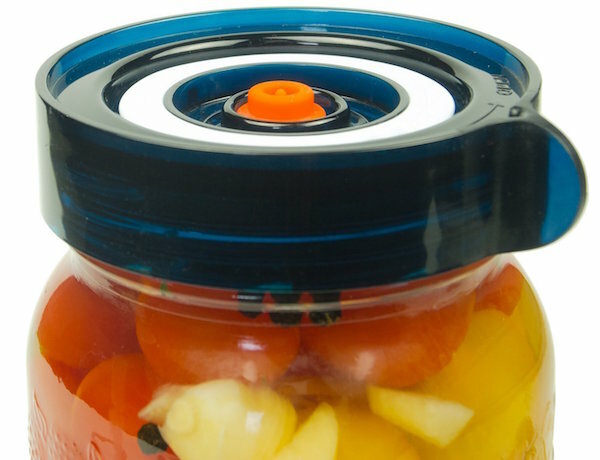 Attach lids (you can also use regular two-piece canning lids, or plastic storage jar lids, but you will have to ‘burp’ them daily – open the lid to let air in – and monitor them more closely) and set on the counter. If using regular lids, a good idea is to set the jars on a tray, cookie sheet, or some other thing that could catch any potential overflow. Label the jar with the date – the Easy Fermenter Lids have a way to mark the date on the top – and let the vegetables ferment (aka, pickle) for 4-5 days at room temperature. The finish date for fermented vegetables is very loose, in fact many recipes just say “when vegetables are finished,” relying instead on the taste test. Since I wasn’t really sure what they should taste like, never having eaten them before, this didn’t feel good to me. After making these many times, I can tell you that 5 days is perfect for our heated house in winter, so you can start there and adjust if needed (a warm summer kitchen may need only 3-4 days, colder may need an extra day). These should taste like any firm, crisp pickle you’ve had. I thought I’d add a photo of what the pickles look like after fermenting and being stored in the refrigerator. The brine will get cloudy as it ferments on your counter, so don’t be concerned about that. After putting a regular lid on the jar and storing in the fridge, the vegetables will continue to develop flavor. They will last for months and months in the fridge – unless you’re like us and they barely make it a week. My whole family LOVES these pickles just as much as the canned vinegar pickles I’ve made for years. We can easily go through a jar a week just eating as a snack. As far as how to fit fermented foods into a healthy diet, it helps to know you don’t need much of them – just a spoonful or a couple pieces of vegetables once or twice a day is enough to get the digestive benefits. We find them easy to add to salads and these picked vegetables in particular make a great addition to vegetable platters or even on their own served alongside your meal. 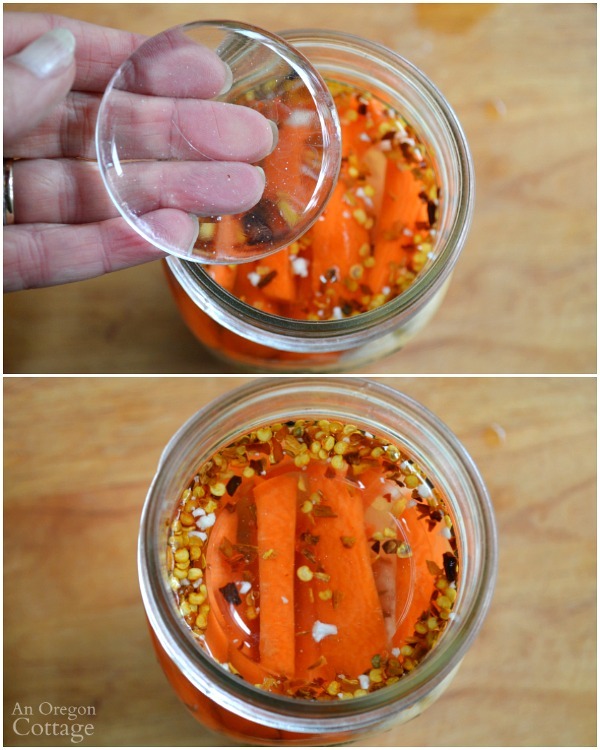 Click the arrow for the full printable fermented pickled vegetables recipe! Want to make your mixed vegetable mix and wonder if I can use my frozen green beans. Have plenty frozen but will use others fresh to fill up the jar. You can, Jan, but I’d start with just a few to see how you like them. They may be a bit softer (mushy even?) than fresh, I’m thinking. I haven’t tried it with beans – frozen corn works fine, though, in our corn relish recipe. Do you need to keep out of the light while fermenting? I just have it sitting on our kitchen counter (though not right in front of a window), so no, you don’t need to find a dark place for this. So glad you found this helpful, Trish – hope you enjoy the vegetables! I found your blog through a link party. Boy I sure do appreciate this wonderful post. I have been drinking Kombucha for a couple of years and have made several batches myself. I purchased a crock to make fermented veggies about 5 years ago and have never used it because it seems like such an ordeal. 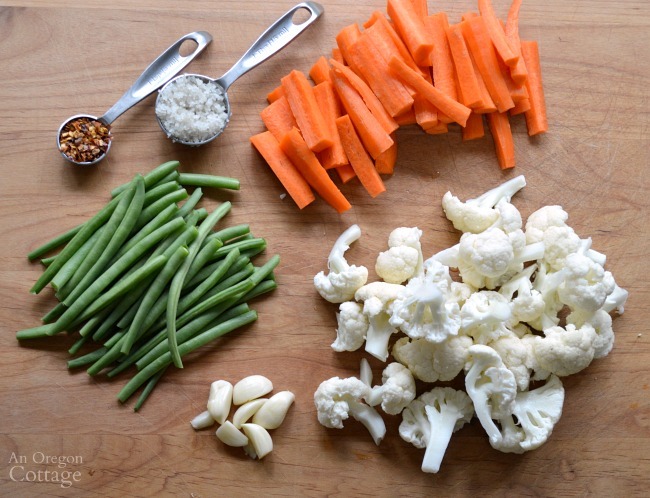 I love how easy you make it sound to make these healthy and very beneficial veggies. Thanks for the wonderful pictures and the links to the lids. You have truly inspired me to try making them. I especially like that I can use Mason jars instead of my HUGE crock because I moved into a very small home with limited space. Thanks so much. I also find it so sad that on a home decor blog you will find a bunch of comments about something that has no health benefits at all. And then on such a lovely blog post as this one people don’t make time to comment about things that can make a world of difference to their health, or their families health. Their priorities are all mixed up. Strange world we live in. You may be interested in making Kefir water.. its wonderful for your health. I hope this makes it easy enough for you to make often like it has for us, Tonita. It truly has been a blessing to us. I have made milk kefir for my husband, though it made his stomach cramp (so odd), vs. the store-bought. I’m thinking of changing my kefir grains to water kefir – I’ve researched and it can be done! Thank you – I’ll check it out! Will this brine be appropriate for pickling cucumbers or should I add a bit more salt? New to this, purchased cucumbers and other veggies from local farm yesterday but brines I’ve seen so far are for multiple jars brine being ( 3/4 cup sea salt to 4 gallons water) whereas I only want to make 2 quarts and 2 pints of fermented veggies until I’m sure family will enjoy them. Yes, I plan on using this brine if I get some cucumbers this year, Joycelyn. It’s easy to adjust to more if you like, but this is pretty salty we think, so I think it will make fine pickled cukes. Is there a reason you don’t use onions …..is it ok to use them. Yes, pretty much any vegetable that pickles well will ferment well. Onions would be great! How far do you have to open the lid to burp the jar? I don’t have to do this with the lids I use, but I’ve read that it’s just a crack and then tightly reseal. Why not Broccoli. Does it not work. You can certainly try it – I’d just do a few florets, though, to see what it’s like.